It's a bird! It's a plane! It's Growth Mindset! Wait? What? Yep, you heard me...it's Growth Mindset! Growth Mindset is riding to the rescue of students everywhere! Always on the lookout for truth and justice, Growth Mindset is using amazing powers to give hope to fledgling students in a classroom near you! Growth Mindset is a powerful concept for students to grasp. It helps students defeat the foes of "I can't!" and "It's too hard!" and "I'm not smart enough!". 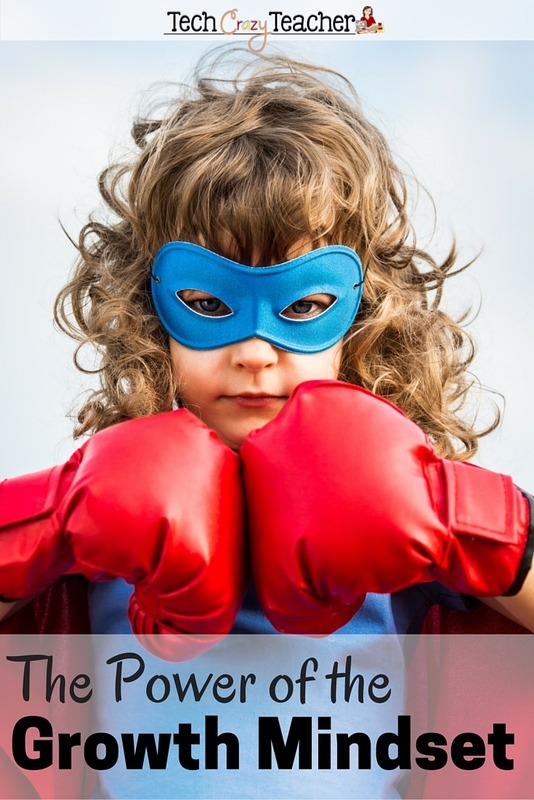 Growth Mindset is the belief that abilities (maybe even "super" abilities...Ha!) can be developed through hard work and dedication. Students who grasp the Growth Mindset become willing to try even if a task is hard. They give their best effort each and every time they attempt something. They are not scared of failing but, rather, see failure as a learning experience. Students with the Growth Mindset don't believe they can't but believe they just can't YET! The word, "YET!" is a powerful word. Maybe even a "SUPER" powerful word! Just 3 letters but, oh, so mighty. I had no idea that this word could change so much. It gave my students hope. Hope that if they kept trying, they would eventually succeed. How do you use the power of "yet"? Add it to the end of the doubts that your students have. "I can't...yet." "I don't know multiplication...yet." "I'm not smart enough...yet." "I can't do it...yet." With the Growth Mindset, students believe failure is not the end. They believe it is just a stepping stone to new learning! The arch enemy to Growth Mindset is the Fixed Mindset. Students with the Fixed Mindset give up easily, stop trying when tasks get hard, and blame their failures on others. They believe they were born with everything that they are going to get. These students think they can't and that they aren't smart enough. Failure is the end and a horrible outcome. There is no hope. I didn't learn about Growth Mindset and Fixed Mindset until recently. But learning about the Growth Mindset changed my teaching strategies. It changed the way I speak to students, and it changed, well, frankly, me. I stopped saying things like, "You are so smart," and instead, said, "You tried really hard on that." 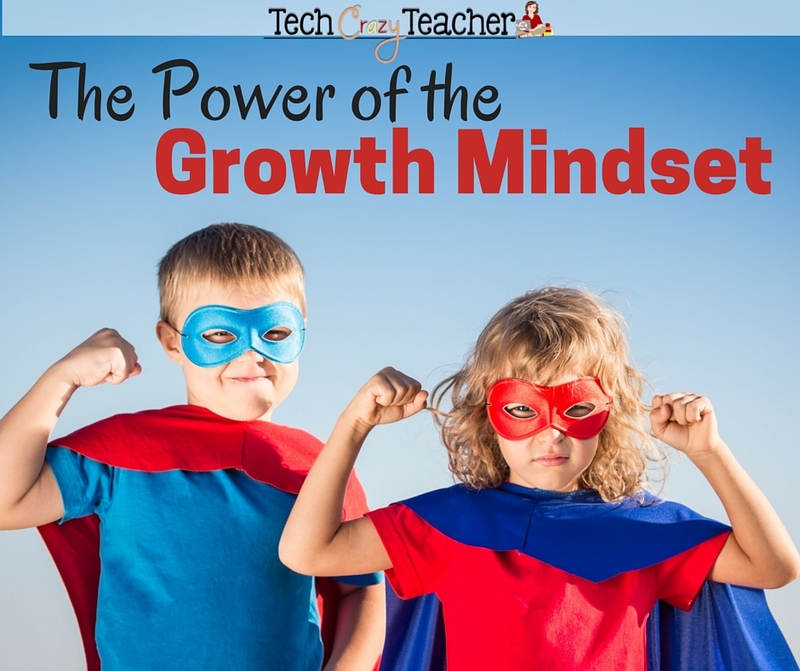 The Growth Mindset power transformed my classroom! I found that by teaching the Growth and Fixed Mindsets to my students, we had a much better year. The, "I can'ts," were defeated in my classroom! The student buy-in was enormous! Students would correct other students if their mindset got out of wack. They cheered each other on and most importantly, they kept trying! 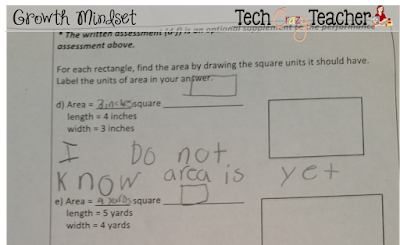 This student was taking a pretest on area. This is the resource I used to introduce the power Growth Mindset to my students. There is a PowerPoint, posters, handouts, parent letters, goal setting sheets, and even surveys. It also contains books and video links dealing with the Growth Mindset. 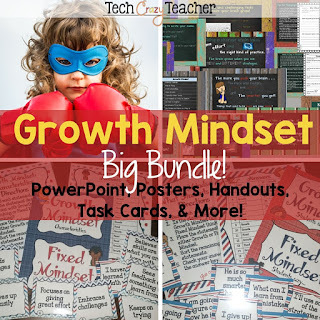 Click HERE for the Growth Mindset Bundle!" As we begin to embrace the 21st century strategies and values, we must turn our attention to the Growth Mindset. In a society where trophies are given instead of earned, we need to focus on teaching our students what the Growth Mindset is and how it can help in the learning process. As you are getting ready for back to school, think about what you want your students believing about themselves. What affirmations do you want them to take-away from your classroom? If you don't do anything else, add the power of the word, "YET!" to the end of, "I can't," statements. Embrace the Growth Mindset! Want to learn more about the Growth Mindset? Check out my Crazy for Student Motivation Pinterest Board!